Instructions: Prepare a 5 x 7" white card base topped with a piece of the Buttons and Blooms paper cut 1/4 inch smaller. Cut out one of the elegant Borders and place on the left side of the card. Locate and cut out the border of Buttons and adhere on top of that. Cut one of the Butterfly round dies out of white card stock, stamp the sentiment on that with the Manganese Blue ink, add foam dots to the back and adhere to card. 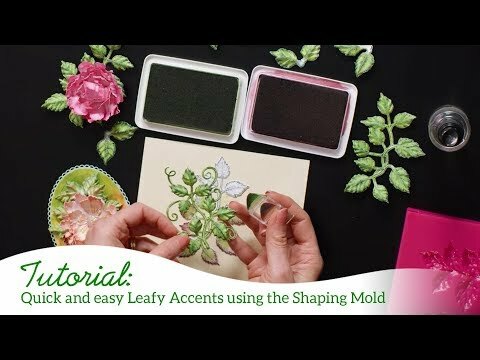 Stamp the leaves on white card stock with the Library Green ink, color in with the Leaf Green, cut out with the coordinating die, run through the die cut machine to shape, ink the edges with the Emerald Green ink, and adhere to the card around the circle. 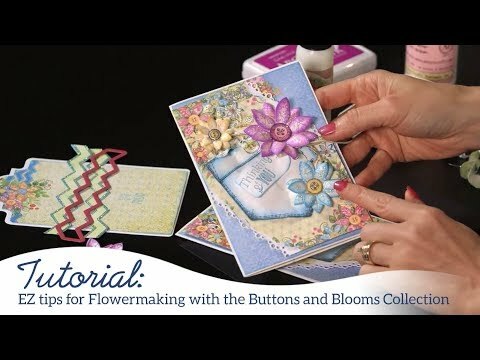 Stamp the flowers on the colored cardstock with the matching inks, heat set, and cut out using the coordinating die, shape using the Flower shaping kit. To finish the card, add glitter to all the leaves and flowers and micro beads to the center of each flower.